Paul cures a lame man at Lystra. HE PEOPLE OF Lystra were idol-worshipers. Never before had they heard the story of the gospel and many of them did not know about the true God of all the earth. When Barnabas and Paul began to preach the gospel in the streets, their words sounded strange to these heathen people. They paid little heed to the preaching until after they had seen the wonderful miracle which Paul performed upon a cripple. A helpless cripple sat near by listening intently while Paul was preaching about Jesus, and when Paul noticed him he knew the poor man had faith to be healed. He looked on the man and cried with a loud voice, "Stand upon your feet!" With a leap the cripple rose to his feet and began to walk about like a well person. And the people were amazed, for they had never seen such a miracle before. Now they crowded round to look in wonder upon the missionaries, and they talked rapidly in their own language, saying, "The gods have come down to us in the form of men!" Paul and Barnabas could not understand what they were saying, for they used the speech of their own country instead of the Greek language which Paul had been using while he preached to them. Excitement seemed to increase all the while, and presently Paul and Barnabas saw the men leading oxen to sacrifice, and bringing wreaths of flowers with which to decorate their visitors. Then the missionaries knew these heathen people had supposed they were gods come down to earth, and were preparing to offer sacrifices to them. The Greeks worshiped two gods called Jupiter and Mercury, and the people of Lystra worshiped those gods, too. Now, they believed that Barnabas was Jupiter, and that Paul was Mercurius. And they called their priests from the temple of the gods to come and offer sacrifices to these men. A feeling of horror came over Barnabas and Paul when they knew this. They rushed among the crowded throng and tore their clothes, crying out, "Sirs, why are you doing this? We also are men, like you are, and we have come to preach that you should turn away from idols to serve the living God who made the heavens, the earth, and all things. It is this living God we preach, who gives us rain from heaven, and who causes our food to grow in the fields." 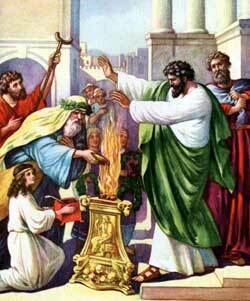 At first the people would not listen to Paul and Barnabas, but finally they were persuaded to cease from their purpose. Although they understood the Greek language, they did not understand about the true God, for their minds were filled with thoughts of idol-worship. Only a few who lived in that city received the gospel gladly and were saved. When the missionaries had been in Lystra for some time, the wicked Jews in Iconium heard that they were preaching about Christ to the idol-worshipers in this city. So they sent men to Lystra to tell untrue things about the missionaries. Many of the people believed these false words and caught Paul and threw stones at him until he fell down as if he were dead. They seized this bleeding body and dragged it outside their city, then returned to their homes again. But the believers stood about Paul's body, weeping. Presently they saw it move, and they knew their dear friend was not really dead. Soon Paul rose up and walked with them back to the city. On the next day he and Barnabas went away to another place, called Derbe, and here they preached the gospel just as courageously as before Paul had been stoned. After spending some time in Derbe, and seeing many people turn to the Lord, the missionaries bade them good-by and started on their homeward journey. As they went they visited the same places where they had been before, and spoke encouraging words to those who believed in Jesus. Finally they came back to Antioch, in Syria, the place from which they had started on this missionary journey. Here they met with the church and told how God had blessed his word as they preached to the Gentiles in far-away cities. They told about the believers in those cities who were worshiping the true God and honoring Jesus as the Son of God. And the disciples in Antioch rejoiced to hear these good tidings.